Philippine Opera Company's Young Artists Series Returns with "T'Aint Opera"
After the success of “Love Sings!”, Philippine Opera Company’s Young Artists’ Series (YAS) is back for another production this season. 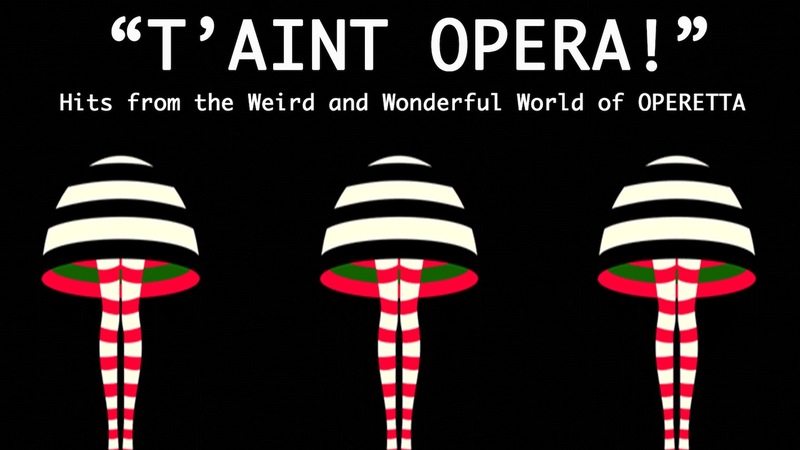 In cooperation with the Cultural Center of the Philippines and The Friends of the Philippine Opera Foundation, “T’AINT OPERA!” (Hits from the Weird and Wonderful World of OPERETTA!) will be having a one-night-only performance on July 18, 7:00 pm at the lobby of Tanghalang Nicanor Abelardo (CCP Main Theater). An operetta is a short opera, usually on a light or humorous theme and typically having spoken dialogue. It is often considered less “serious” than operas. While an opera’s story is usually believable and more relatable to its audience, an operetta aims to simply amuse. Notable composers of operettas include Offenbach, Johann Strauss, Lehár, and Gilbert and Sullivan. “T’AINT OPERA!” is an extravaganza of familiar, easy-to-listen-to music combined with dance, acting and storytelling that recalls happy memories of a time when life was less complicated. It’s a musical confection that delights the ears and eyes, leaving audiences feeling joyful and filled with energy and optimism, ready to take on the year – and world – that lies ahead. Listen to arias from “Die Fledermaus”, “Merry Widow”, “The Mikado”, “Pirates of Penzance”, “The Land of Smiles”, “Yeomen of the Guard ”, “Christopher Columbus ”, “Candide”, “Kismet” and many more. POC’S Young Artists’ Series (YAS) started in October 2012, as a soiree every third Wednesday of the month, featuring our young artists from various colleges and universities. After the success of our first series, POC decided to enhance our YAS program by engaging the artists in more creative work and perform scenes from various Operas—as well as Musical Theater pieces that have crossed over into the classical arena. What makes this event different from other endeavors is the challenge we give to young artists to hone and develop their artistry by giving them the opportunity to stage their own scenes. To assist and mentor these artists, POC invites several established and well-known directors in the theater industry. The YAS program is designed to nurture, train and develop the next generation of talented classical singers. It provides a professional training ground for them in the art and craft of stage performance. Our goal is to furnish them with a solid foundation, which will enable the participants to work on their artistic development during the critical phase between end of formal academic training and the beginning of performing careers. To intensity the growing appreciation for opera, POC developed the “3A” programs that will nurture a new generation of classical singers and audiences — the Artistic Development Program, the Audience Development Program, and the Arts Assist Program. Over the years, the P0C has witnessed the uptrend in the awareness and appreciation of opera and classical-related performances by Filipinos, particularly the young, educated segment of society. “We saw the need of “further” training our classical singers when it comes to acting, text analysis, character analysis and movement because these aren’t part of the curriculum in the conservatories. In the conservatory we learn vocal techniques, theories, the basic languages for singing like Italian, German, French and we have the different music literatures but the fundamentals of theater or script are not incorporated in the curriculum.” shares Karla Gutierrez, Artistic and Managing Director of Philippine Opera Company. 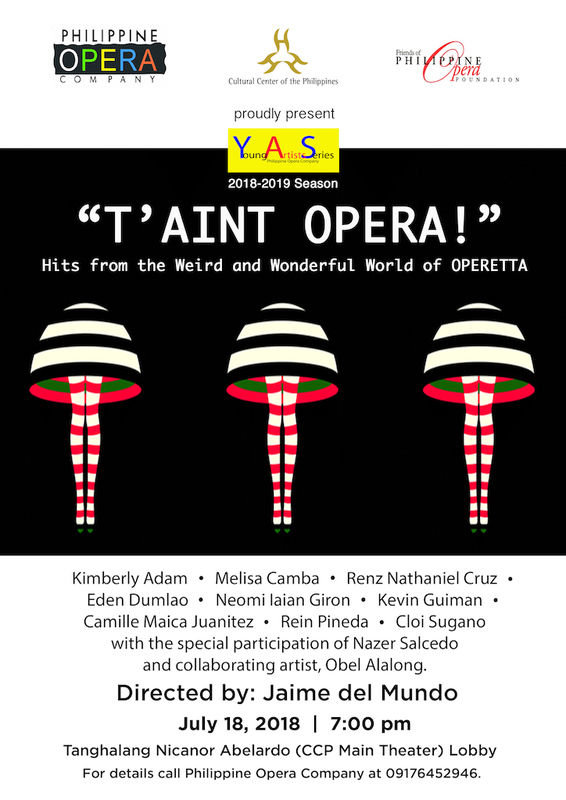 YAS “T’AINT OPERA!” will feature Neomi Iaian Giron, Camille Maica Juanitez, Renz Nathaniel Cruz, Kevin Guiman, Eden Dumlao, Cloi Sugano, Melisa Camba, Rein Pineda, Kimberly Adam with the special participation of Nazer Salcedo. Collaborating artist, Obel Alalong on the piano. “T’AINT OPERA!” will be directed by Jaime del Mundo. 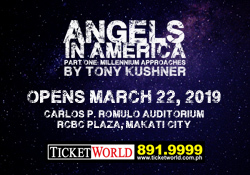 For details call Philippine Opera Company at 09176452946.